As Washington Focuses on Another Benghazi Probe, Could a Civil War Be Brewing in Libya? | Democracy Now! As Washington Focuses on Another Benghazi Probe, Could a Civil War Be Brewing in Libya? While Congress is beginning its ninth investigation into the deadly 2012 attack in Benghazi, Libya may be confronting its worst crisis since the NATO intervention that ousted Col. Muammar Gaddafi in 2011. Fear is growing of an all-out war between militias aligned with the Islamist-dominated Parliament and forces led by a former general named Khalifa Haftar, who was reportedly once trained by the CIA. Haftar has accused the government of fostering terrorism and is calling for an emergency administration to oversee elections next month. Haftar, a former general under Gaddafi, says he wants to rid Libya of Islamists and led an assault against militant groups in Benghazi last Friday. On Sunday, forces allied to him took control of Libya’s Parliament building in the capital, Tripoli. At least 100 people have died since the fighting broke out last week. We speak to Mary Fitzgerald, a journalist based in Libya, and Sharif Abdel Kouddous, independent journalist and Democracy Now! correspondent reporting from Tripoli. JUAN GONZÁLEZ: We begin today’s show looking at Libya. In Washington, the focus remains largely on what happened in the Libyan city of Benghazi on September 11th, 2012, when Ambassador Christopher Stevens and three other Americans were killed in an attack. The incident sparked a fierce political fight between Republicans and Democrats over the Obama administration’s handling of embassy security and the steps it took in the aftermath of the attack. Since then, congressional Republicans have led eight separate investigations into the matter. On May 8th, the Republican-led House of Representatives voted to launch yet another congressional probe. Earlier this week, House Minority Leader Nancy Pelosi announced that Democrats would participate. MINORITY LEADER NANCY PELOSI: I could have argued this either way: Why give any validity to this effort? But I do think it is important for the American people to have a pursuit of these questions done in as fair and open and balanced way as possible. That simply would not be possible leaving it to the Republicans. That’s why I’m appointing my distinguished colleagues here today to serve on the select committee. JUAN GONZÁLEZ: This committee will include seven Republicans and five Democrats. Many Democrats have accused Republicans of exploiting the Benghazi incident to scuttle Hillary Clinton’s expected 2016 presidential bid. Clinton was secretary of state at the time of the attacks. AMY GOODMAN: While Washington, D.C., is focused on Benghazi, Libya may be confronting its worst crisis since the NATO intervention that ousted Colonel Muammar Gaddafi in 2011. Fear is growing of an all-out war between militias aligned with the Islamist-dominated Parliament and forces led by a former general named Khalifa Haftar, who reportedly was once trained by the CIA. Haftar has accused the government of fostering terrorism and is calling for an emergency administration to oversee elections next [month]. He’s a former general under Gaddafi. Haftar says he wants to rid Libya of Islamists and led an assault against militant groups in Benghazi last Friday. 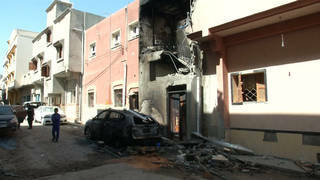 On Sunday, forces allied with him took control of Libya’s Parliament building in the capital, Tripoli. At least a hundred people have died since the fighting broke out last week. On Wednesday, Haftar called on the government to hand over power to the country’s top judges. KHALIFA HAFTAR: [translated] Following the refusal by the expired National Council to meet the people’s demands, the High Council of the Armed Forces call on the High Judicial Council in charge to meet the army’s demand for civil and political stability in Libya, and ask them to form a high council to rule the country. AMY GOODMAN: To find out more, we go to two guests in Tripoli, Libya. We welcome you both to Democracy Now! Mary Fitzgerald, let’s go to you first. Describe the situation in Tripoli, especially for an audience that is not familiar with Libya right now at all, except perhaps the Benghazi controversy in Washington, D.C.
MARY FITZGERALD: Well, the mood in Tripoli right now is extremely tense, with most Libyans describing the current situation as the most serious juncture that Libya has found itself in since the ousting of Muammar Gaddafi in 2011. There’s a real sense of apprehension here. There is a sense also of people choosing sides. Libya has suffered from increasing polarization in recent months, and that seems to be coming to some kind of a crescendo. Several different dynamics that had been roiling in recent months appear to be coming to a head with the events of the last week. JUAN GONZÁLEZ: And in terms of the existing Parliament, Mary Fitzgerald, it’s been characterized as Islamist-dominated, but it has many divisions within it. Could you talk about some of those divisions, and especially the role of the party connected to the Muslim Brotherhood? MARY FITZGERALD: The National Congress was elected in Libya’s first elections in decades in July 2012. And it’s important to note that the makeup of the Congress, 80 seats in the Congress were allocated to party lists; 120 were allocated to individual candidates. Of the 80 allocated to party lists, the more liberal-leaning party, the National Forces Alliance, won the majority of seats out of the 80. The Muslim Brotherhood-affiliated Justice and Construction Party won the second-largest number of seats. But what was key to the complexion, if you like, of the National Congress was the 120 individual candidates. So the headlines in July 2012, that were based on the results from the 80-party list candidates declaring Libya as a liberal landslide, were extremely misleading. When we saw the 120 independent individual candidates, we saw that there was far more—a far larger component of what is referred to here as the Islamic current than was previously envisaged. This was also bolstered later on by the controversial passage of a lustration law known here in Libya as the political isolation law, which affected the National Forces Alliance. It meant that its leader, Mahmoud Jibril, was banned from holding political office in Libya for 10 years. This law affected people who had worked for the Gaddafi regime in some fora—form, rather. It was extremely controversial because it was a very sweeping law that affected even members of the opposition who had previously served under Gaddafi several decades ago. So all of that created this sense within the wider population here that Islamists, even though there was a perception that they had lost or had not been triumphant in the elections in 2012, that they had managed to dominate the Congress. In many respects, the Islamists within Congress managed to be more savvy political operators. They succeeded more in terms of building alliances and blocs within the Congress. The National Forces Alliance basically fell prey to infighting. It became all but atomized compared to the strong Islamist alliances within the Congress. AMY GOODMAN: Mary Fitzgerald, it’s been three years since NAFTA [sic] declared victory—rather, since NATO declared victory. Several commentators are suggesting that Libya is lurching towards a civil war. Is that fair to say? MARY FITZGERALD: Well, it’s something that many Libyans are discussing. They see this as the most serious point since 2011. Several different things are coming to a head. Rhetoric on both sides has hardened, and there is extreme—increased belligerence. I think one point that’s important to stress is, at the root of the current crisis is this question of legitimacy—legitimacy in relation to political institutions, legitimacy in relation to security forces in the country. To go back to the controversy over the Congress, the Congress in February decided to extend its official mandate. This proved a very unpopular move by a very unpopular body. And since then, critics of the Congress have argued, including Khalifa Haftar, have argued that, essentially, Congress has lost its legitimacy. The supporters of Congress say, “No, it is still the only elected body, congressional body, representative body, here in Libya, and as such, it remains legitimate.” You also have claims of legitimacy related to the armed forces. For example, right now we have two claims in Libya to an army. We have that headed by the chief of staff, which is against Haftar’s moves, and Haftar’s forces, which he has rather grandiosely referred to as the Libyan National Army. So we have very different definitions and very different claims to legitimacy, and that’s the root of the problem here. JUAN GONZÁLEZ: And what about Haftar himself, his history? Could you give us a thumbnail sketch of how he rose to his current position? MARY FITZGERALD: Well, Haftar has a very checkered history in the minds of many Libyans here. And this is one of the reasons why many Libyans I’ve been discussing his moves with in recent days, they have said that “We support the campaign, but not the man,” because they are, if not ambivalent about him, downright wary of him and his motives. And this goes back to his history. He was—he served under Gaddafi. He is associated very much with Gaddafi’s disastrous war in Chad in the 1980s. After that, he defected and lived for several decades in the U.S., returning to Libya during the 2011 uprising. I was in Benghazi when he arrived there in early 2011, and there was a sense of what people would do with him, because at that point there was a commander of the opposition forces, and Haftar was given a role which was almost equal to that, but the two men continued to jockey for power, which left a bad impression of Haftar in many respects. After the uprising, Haftar took on a rather low profile. But what I was struck by in the last couple of years was, every time I visited Libya, people would say, “Where’s Haftar? What’s Haftar up to right now?” There was a sense that Haftar was somehow planning something, that he was trying to gain some kind of support base. And indeed, in media interviews in recent days, he has said that he had been planning this for over two years. So that’s before the elections to the Congress, before the security situation in eastern Libya unraveled to the extent that it did, which raises, I think, interesting questions about his motives here. AMY GOODMAN: Sharif Abdel Kouddous, you are also in Tripoli right now, and you had a chance to interview Haftar. Can you describe what that conversation was about? SHARIF ABDEL KOUDDOUS: Yeah, I reached him on the phone from his base just outside of—outside of Benghazi. And he—and I think the most striking thing he said, which he has said in other interviews, as well, was that he was not open to negotiation, that he would rely on force to achieve his objectives. And as Mary mentioned, he told me that there had been some kind of planning happening for a year and a half; in other interviews, he said over two years. He often spoke of the militias that he’s fighting in Benghazi as a foreign entity, international jihadis who are not Libyan. He spoke of them as coming from other countries. And he also denied accusations that he has received support from abroad, from Egypt, from the United Arab Emirates. And he said quite bluntly that he has not been in contact with the United States. He called on the international community to help Libya politically and economically, and he repeatedly painted this offensive as part of a larger global war on terror. But as you know very well from your experience in the United States, we’ve had a war on terror for more than a decade now, and the question is: When does a war on terror like this end? When does Haftar declare mission accomplished? AMY GOODMAN: Sharif, the parallels you see—or do you see any—between Libya and what’s happening in Egypt, in your own country? SHARIF ABDEL KOUDDOUS: Well, parallels have increasingly been drawn. When I speak with Libyans here and they hear my Egyptian accent, they often refer to Sisi and say, “We want someone like him here, and Haftar is like Sisi.” Haftar is like Sisi in terms of that he’s riding a popular wave of anger against an Islamist-led government. People are very fed up with this campaign of violence and assassinations that’s been happening in eastern Libya, particularly Benghazi, by Islamist militias that have left scores of former military and police officers and judges and lawyers and activists dead. The comparison is convenient for both sides. I mean, Haftar has portrayed his offensive as a war on terrorism, and in a press conference a few days ago he referred to the Supreme Council of Armed Forces, which is a previously unknown entity in Libya but bears the same name as the military council in Egypt that Abdel Fattah el-Sisi used to head, who’s—who was the—who is expected to win presidential elections next week in Egypt. AMY GOODMAN: Sharif, you’re cutting out. We’re going to switch for a moment to Mary Fitzgerald, who is also there in Tripoli. Juan? JUAN GONZÁLEZ: Yeah, Mary Fitzgerald, I wanted to ask you about the group that Sharif mentioned, Ansar al-Sharia, who is considered the group—it’s gotten a lot of attention here in the U.S. as the group supposedly behind the attack on Benghazi that led to Ambassador Stevens’s death. Your reporting on how—their level of popularity? What’s been happening with that group? MARY FITZGERALD: Well, what is interesting about Ansar al-Sharia in the last year or so is how it has evolved from being the armed group of some 250, 300 men under arms in 2012 to what is essentially a broader social movement in Benghazi right now. What they have tried to do is concentrate on charitable works and preaching, in an aim—in an effort, rather, to gain hearts and minds in the city. They’ve very much focused on that, trying to give the sense that they’re very much part of society, part of the population in the city. And this has made the debate here in Libya over how to tackle the issue of Ansar al-Sharia very, very difficult indeed. There’s been a very contested debate in recent months. It usually flares up after there’s been clashes in Benghazi between Ansar al-Sharia and the security forces, a debate over how to tackle this: Should this be tackled through dialogue, or should it be tackled by force? Now, Haftar seems to have tipped the scales on this one, leading fears—leading to fears of a wider conflagration. It’s important to note, as well, that Haftar has talked a lot about a war on terrorism, but he’s given few details on the parameters of that, where it would begin and where it—exactly it might end and who exactly it would target. He has given interviews saying—to the Arab media, saying that he considers the Muslim Brotherhood the main enemy, and vowing to clean it from Libya. In Benghazi, we’re talking about a city—and eastern Libya, more generally, we’re talking about a region with an extremely complex social tapestry. It’s not uncommon, for example, to find families in eastern Libya where you will have one member who is a member of the—one relative who’s a member of the security forces and another who is a member of Ansar al-Sharia. Ansar al-Sharia is basically now drawn from across the socioeconomic spectrum. Some people I met in Benghazi recently who have been mediating with Ansar al-Sharia, they estimated that its membership now stands at more than 4,000 in Benghazi alone. AMY GOODMAN: I want to turn to remarks made earlier this week by the U.S. ambassador to Libya, Deborah Jones. Speaking at the Stimson Center in Washington, D.C., Ambassador Jones said she would not condemn the actions of General Haftar, whose forces stormed the Parliament on May 18th. AMBASSADOR DEBORAH JONES: Frankly, it’s not necessarily for me to condemn his actions in going against very specific groups, which, as far as I have seen, has been extremely specific, warning civilians to move out of the way and really attacking groups that, frankly, are on our list of—you know, of terrorists. I mean, I’m not saying that’s the best way to deal with them at all, and I’m not supporting it from that perspective, but I’m—what I’m saying is, I personally am not going to come out and condemn blanketly what he did in that specific instance. AMY GOODMAN: That was the U.S. ambassador to Libya, Deborah Jones. Mary Fitzgerald, this whole issue of Benghazi in Washington, D.C., that’s top headlines here, calling for a re-investigation into what happened in the killing of the U.S.—the previous U.S. ambassador, as well as three other Americans, how is that understood in Libya? MARY FITZGERALD: Well, that entire episode and the political tempest that continues to rage in Washington, I have to say, hardly impacts on the public debate here in Libya over this issue, because apart from the attack on the diplomatic compound, the U.S. diplomatic compound, in 2012, people in Benghazi have experienced a string of assassinations of, as Sharif mentioned earlier, not just members of the security forces, but civil society activists, journalists and lawyers and judges. And we’re talking about assassinations that have crept into the hundreds at this stage. So this, for Benghazians, is a wider issue beyond the debate raging in Washington. I think, to go back, though, to what the—how the ambassador’s—the U.S. ambassador’s remarks were interpreted here, certainly, a broad range of Libyans I’ve been discussing this with have interpreted it as an implicit support for what Haftar is doing. And some are concerned about the fact that, apart from Haftar’s much-vaunted war on terrorism, if we look at the trajectory of what has unfolded over the last week, since those initial clashes—the initial attack, rather, on several Islamist-leaning militia bases in Benghazi, what we’ve seen since are actually attacks and a focus on the Congress, the elected Congress. So, on Sunday, forces loyal to Haftar carried out an armed attack using heavy weaponry on the Congress here in Tripoli. Since then, Haftar has focused very much on getting rid of the Congress. In many of his comments in Libyan media here, he has proposed different options in terms of how that might work. But people find that interesting that he’s focusing on the Congress as much as the so-called war on terrorism. The forces that attacked the Congress on Sunday are forces who in February actually threatened the Congress. They warned Congress that if it did not dissolve itself within a matter of hours, then the members would be captured by these—by these particular militias threatening it. This threat was seen as so serious at the time that it prompted the intervention of the U.N. envoy to Libya. So there is concern here, among certain circles in Libya, that this is basically an effort to push Libya off the democratic trajectory. JUAN GONZÁLEZ: Sharif, I wanted to ask you about another comparison with other countries in the region that have experienced popular uprisings. In both Libya and in Iraq, you had an international intervention—in Iraq, it was obviously the U.S. invasion, and in Libya, a NATO bombing campaign—that not only overthrew the dictator, but also dismantled the military forces of the country. And in Egypt, on the other hand, the United States did everything possible to assure that the Egyptian military remained as a viable force in the country. Could you talk about how you see this issue? Because, obviously, when the armies are dismantled in Iraq and in Libya, you have the void filled by all of these insurgent groups that develop. SHARIF ABDEL KOUDDOUS: Right. Well, I mean, in Libya, the government here did not create—or failed to create a unified military force from the scores of well-armed militias that emerged from the revolution, and it opted [inaudible] to pay them salaries, even though they remained loyal to their commanders rather than the state. But, you know, analysts have told me that, you know, after the NATO bombing, the international community largely let Libya—set it adrift. This issue of Benghazi and the murder of Chris Stevens is put a little bit back in the headlines in the United States, but really, they abandoned the country to itself. It didn’t have the capacity to build its own state. I think it needed some assistance in its democratic transition. But there are very different parallels, like you said. In Egypt, the army is the main ally. It’s the main contact between the Pentagon and the army, is the strongest relationship that Egypt has with the United States, much stronger than the contact between the State Department and the government in Egypt. So, you know, it’s a very different situation. You know, Libya, there’s no—there’s no relative balance of force—or, there is a relative balance of force in Libya, excuse me. There’s—you know, it’s actually quite even between the different forces, and there’s no single entity that’s able to deploy nationwide military supremacy. So, very much unlike the army in Egypt, which has national legitimacy and a virtual monopoly on violence, Libya doesn’t have that. You know, in a way, it’s one of the things that it has going for it. The outcome of a military confrontation is still too uncertain. But in Libya, it’s more like you have 10 [inaudible], and they’re all fighting each other. AMY GOODMAN: Finally, unfortunately, Abdullah Elshamy’s brother was not able to join us today, but he is on hunger strike, just been put in solitary confinement last week. And, Sharif, you have talked to him, the Egyptian journalist who works for Al Jazeera, one of the four who are still held. Can you, in this last few minutes, just talk about his situation? AMY GOODMAN: Ah, we’re losing you. SHARIF ABDEL KOUDDOUS: Can you hear me now, Amy? AMY GOODMAN: Sharif, we have 30 seconds. SHARIF ABDEL KOUDDOUS: —general population. He was taken from general population and put into solitary confinement. His family says the prison administration is trying to break his hunger strike. This is part of a large crackdown on the media in Egypt, and there’s other three Al Jazeera English journalists, as well, who are currently on trial on charges of terrorism. AMY GOODMAN: I want to thank you both for being with us, Sharif Abdel Kouddous, Democracy Now! correspondent, fellow at The Nation—we’ll connect to your front-page pieces in The Washington Post this week—and Mary Fitzgerald, independent journalist based in Libya. When we come back, we’re going south to Chile to hear about a young activist who burned what looks like something like $500 million worth of documents around student loans. We’ll talk to Papas Fritas in a moment.